When Birdo was introduced to North American gamers in the pages of the Super Mario Bros. 2 instruction manual, there was no question as to the character's gender. "He thinks he is a girl and he spits eggs from his mouth," the description reads. "He'd rather be called 'birdetta.'" Also worth watching if you're part of the is-it-a-he-or-a-she set: The "Birdo is Male Proof Video." One portion in particular blew my mind when I watched it for the first time earlier today--that being the portion that suggests (based on the Japanese website created for Mario Kart Double Dash!!) Birdo/Catherine is Yoshi's boyfriend. So, not only is Birdo transgender in some way, but Yoshi is gay to boot! 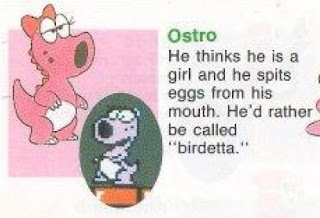 I've always been curious about any official statement regarding Birdo's gender. I seemed to remember reading the "Birdetta" snippet once upon a time, but then when I went back to look at a PDF of the SMB2 instructions, it was gone. That would make sense, then. And as far as the whole Yoshi/Birdo relationship status...I think Facebook would say, "It's Complicated." Yoshi rides around with a large man on his back. He comes in a rainbow of colors, and he switches functions in some games to be anything you need. Sounds pretty gay to me. Very nice. That video, BTW, is creepy as hell.